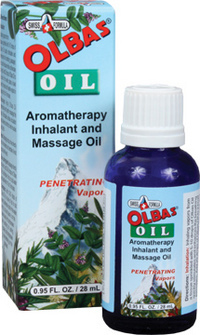 Olbas Oil, .95 fl oz (28 ml) - Penn Herb Co. Ltd.
Olbas Oil is a completely natural aromatherapy essential oil formula that delivers invigorating and soothing sensations to the nasal and bronchial areas. When applied to the body, Olbas Oil tends to stimulate circulation at the surface of the skin. It opens up the pores and provides a comfortable feeling in the muscles and joints. Runners, cyclists, and other sports enthusiasts praise the value of Olbas Oil. Massaging with Olbas Oil helps loosen muscles and make them supple while inhaling Olbas vapors helps support endurance and performance. Inhale the aromatic oils for extraordinary benefits to nasal and bronchial areas – its penetrating vapors enhance breathing passages. Massage body to comfort tired muscles and joints. Rub on muscles before AND after strenuous activity to reduce soreness. When you need a little comfort, each drop of Olbas Oil means relief. Essential Oils of Peppermint, Eucalyptus, Cajeput, Wintergreen, Juniper and Clove. Quickly enhances breathing passages (inhalant, vapor therapy); stimulates circulation; comforts tired muscles & joints (massage oil, hot compress); soothes sore, aching feet (massage, foot wash); refreshes forehead (cold compress). Sports: Apply before to help loosen muscles, then AFTER sports or exercise massage to help reduce soreness and soothe overworked muscles. See more uses for the versatile Olbas Oil. MASSAGE: Apply generously and gently massage the body (won't stain most natural fabrics). INHALANT: Sprinkle 5-10 drops on a tissue and inhale deeply or add 10-20 drops to a bowl of hot water, place towel over head & inhale for about 5 minutes.